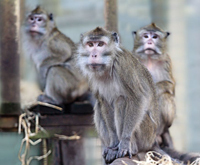 Revealed by ADI USA: the needless use of monkeys for disease research. These painful tests cause untold suffering and waste funds that could otherwise be spent on advanced alternatives. On International Primate Day, September 1st, please help us stop these unnecessary and unethical monkey tests. 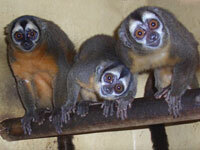 There is no need to use monkeys for smallpox research. The last known case of the disease was in the late 1970s and it was officially declared as eradicated in 1980. Vaccines for smallpox have already been assessed in people and a number of countries including the US and UK have stockpiles. 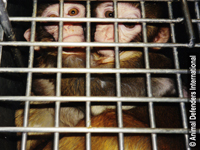 Sadly in the US alone over 70,000 monkeys are experimented each year; in the UK the figures is over 2,000. Many are imported from countries like Mauritius where ADI has exposed terrible suffering on breeding farms. With the exception of Air France, all major passenger airlines have ceased their involvement in this brutal trade.